The following is an extract from an interview Dr Julie Forsey had with Don Hanson in March 2018. 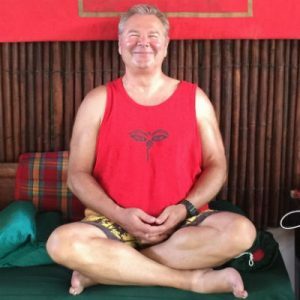 During this enlightening conversation between friends Don shares his wisdom on various topics including; getting out of our heads and into our feeling bodies, the power of listening to the intelligence of the universe and the nature of kundalini energy and how it opens us once we are ready. The energy is Pure Health. How do you work with the energy? I use my body as an instrument. I imagine that it’s like two tuning forks. My body is a tuning fork. I have learned to get out of the way and read my body in relationship to another person, I feel their ‘pitch’, so whatever vibration or frequency they have, whatever they are holding inside, all I have to do is open up to them and I can feel exactly what’s going on in their body, in my body, Because I’ve spent a lot of time clearing my own body I can trust what I am feeling. Is it an ability you are born with, and can other people develop this? I think everybody has this gift. Most of us are born into families and situations where feelings are discounted and intellectuality is emphasized. Feelings are neglected. There is no education for how to work with your feelings, your own body awareness and your emotions. Most of us are very feeling people. If we grow up in countries that are more intellectually oriented that feeling self gets really neglected. This can be really challenging for really sensitive people who feel everything, but they don’t know what to do with their feelings because nobody ever taught them. So they think that what they feel is them. They haven’t learned to differentiate that most of what they feel comes from their environment, from those around them. I grew up an extremely sensitive ‘feeling’ boy and I had no structure for how to deal with what I was feeling and what my body was perceiving. I thought there was something majorly wrong with me. If we are living in the intellect is that the same as disconnection? It is, because if feelings are not included then we are literally trained and taught to split away from our bodies, our emotions and our feelings. This is disconnection. Most people are not in their bodies. For most people in our society, our culture, living in the body is not a recognized way of being in the world, it’s not seen as ideal. So there’s a lot of prejudice about being in the body? Yes, people who feel too much are ‘too reactive’, ‘too sensitive’. We get many messages over time to disconnect from our feeling self, and yet our feeling self is how we have learned to maneuver through our world, our planet, probably for thousands of years. Most animals have very profound instincts. They use all of their senses, their hearing, their smell, their taste and also their feeling. That has genetic survival benefits; it’s passed down for thousands of years. We all have that profound innate ability to perceive our environment through the sense of our body. So if our intellect is our human brain, our feeling brain is our mammal brain and our urges and cravings are in our old brain, to come back to the body is to come back to the old brain, and I wonder if this might be why there is so much prejudice against embodiment? I wonder if it is more than just prejudice, I wonder if we have become so intellectual that we just forgot how brilliant our bodies are. We have developed brilliant brains but we forgot that most of us are geniuses. To me that same genius is also in our physical bodies. Our bodies are so brilliant that they can feel into the future, they can even feel what´s coming the next day. That´s the genius we carry in our bodies. Our bodies have the ability to tune in so deeply that we can feel other people half way across the world. If we tune into them we know what they are going through and what’s happening to them. We have that genius and that ability through our body. Most of us have been programmed to neglect that aspect of our genius and just focus on memorization and intellectual endeavor, learning though observation and memory. I think what I did was more feeling oriented and less intellectually oriented, and because of that I never quite fitted in, in my growing up years. In the intellectual memorization world, if I got ‘C’s ‘ at school I was happy. The first two years at university I was studying wildlife biology with a lot of anatomy and physiology, and it was all memorization, so I got all C’s the first year. I got a C+ in my second year and I was really pleased to get that with this brain! I didn’t have the ability most people have to memorize, and the reason for that is that I had a gift, and that gift was the genius of my body. So I started to develop my intuitive ability. I entered this counseling program and I ended up in this centre in Canada where I signed up for a three-month residential program in 1975 with two doctors who were very much into feeling and emotions and they nurtured that part of me. I was with a psychiatrist called Ben Wong, a Chinese man who was very smart, very intelligent and he lived his world through feeling and in his career he was a child psychiatrist, and he could relate to kids through feeling and he helped me to heal and trust my damaged feeling-self. Can you tell me more about how you read the other person’s body and how it is different from psychotherapy? A lot of psychotherapists are trained through mental processes; they don’t really learn to work on themselves. They learn structures, they learn techniques and they learn belief systems; e.g., you don’t do that you do this, this is allowed, that’s not allowed etc. So from my perspective there’s a limitation in technique in how far you can take a person in their deep healing and transformation. In a way techniques tend to be ‘canned’, its formula and formulas are limited because they come from the intellect and the intellect doesn’t really understand how the universe works. It has developed tools, structures and mental understanding but the universe is really a feeling universe, that’s why most creatures are feeling creatures including human beings. I had a teacher at one point in my PhD program that was very mental, and I never quite fitted in there. I had a really hard time with that because there was no energy in it. It all sounded really good, brilliant insight, but I never felt energy in it. Then one day in California I met this woman, she was running these big groups, and when I went to her I started tingling inside my body. Then I went back and I started tingling again and I thought, ‘this woman is in her body’. She had been a famous family therapist in Marin Country California and now she was working out of her feeling self. She was speaking from her center and from her inner guidance rather then from a technique from her mind. She was so connected with herself that what came through her was a transmission of energy. I sat in that group for 6 and half years. She said if you want to learn how to do this I want you to stop what you are doing, get out of your head, stop making it happen out of your own strength, and I want you to come here and just surrender. So I made a decision to do that. I learned to still my mind, to empty my mind. My mind was so full of thoughts I needed to do that. She said, ‘we are going to start all over again from a whole new place. I want you to feel your way with this, ´. I allowed myself to observe and participate at a feeling level. It took me 2 years to really feel what she was doing. Somewhere in her body and through her body she had connected with the intelligence of the universe. This intelligence was greater than her and greater than me. It was within her at the deepest most fundamental level of her intuitive sensing ability. The only way that she was able to access this was to get out of her head, to get out of her own way and listen. What happened over time was that this information would bubble up through her from Greater Mind, from her center. She taught me to do this through observation and participation in her class. Twice a week for six and a half years I observed and opened myself up to feedback because I wanted to learn this. I was a very good student. I realize that this was innate in me all along and she was the first person who nurtured it or recognized that I had a very similar ability to get out of the way as she had and access this beautiful intelligence that is in the universe, that most of us are completely oblivious to. The religions kind of touch it, but they have so much dogma wrapped around it that is has become an intellectual process too, rather than a feeling process. Over the years I began to realize that as I connected with my centre, with Greater Mind, that it had its own intelligence. It had its own rules and laws that were quite different than the structure of my mind. My mind had a lot of ‘right and wrong’ and ‘good and bad’ in it, but this had no rules, there was no judgment, it was just pure love and a desire for connection. So I left the field of psychology and came back in a different place. I thought; I will graduate from the field of psychology and develop a practice of living from Greater Mind, where I get out of the way without any agenda, start a group and just let the energy orchestrate and guide the happening. Over many years I developed a relationship with it and would talk to it, just like a friend, and it would talk back. I would ask it for certain things and the information would bubble up inside of me and the information was always ‘high’, a high information. When I would work with people in groups or private consultations I learned to empty my mind and use my body as the tuning fork, the instrument. I would come in and tune into the person, have a little conversation and I could feel what was inside of them and I thought, ‘my god I’ve always felt this and I thought it was me!’. I thought there was something wrong with me. Then I began to realize that 98% of it was not me. How is your work different from people who have done a lot of yoga, coming from the heart? My work is different in that I realize there is Greater Intelligence than my own. Someone once said, ‘I of myself can do nothing it is my father and mother in me that doeth the works’. So I think I access that intelligence and the intelligence expresses itself through my feeling body. So not just from a heart connection? No, not just the heart, it’s the whole body. If I try to do it from the heart then I am really doing it from my intellect because I am trying to do something that is quite limited. I am trying to just be ‘the lover’. But the universes love can come through pure truth. The universe imprints me from the inside and I feel this energy coming up that wants to express through me, through my vocal cords and I am out of the way. Then it nudges me and comes up a couple of times, then I know that this is that greater voice that’s coming from the whole of pure wisdom and pure consciousness that’s separate from my own. So I always speak it even though I don’t understand what it is even saying sometimes. Sometimes it is very confrontational with someone, my mind would want to smooth it out and make it loving, but sometimes when that energy comes through it’s like a knife, it cuts right through. So I learned to trust that 100%. I never censor it. So whatever bubbles up in me, because I am listening and I speak from that place, from my centre, from Greater Mind, so I trust whatever bubbles up is the voice of the intelligence of the universe speaking, and using me to touch that person. Can you tell me more about the feelings that I experience in the genital area, at the perineum in your work? Can you tell me more about that and how it connects with the divine energy? I think if you look at the ancient Hindu religion they talk about the chakras, the 7 centers in our body. Our root chakra, the first two chakras, are connected to a dormant, brilliant intelligence at the base of our spine and when that gets activated, it releases a fountain of energy that goes off through the body and takes the body through a very deep purification process. They call it Kundalini. Kundalini awakening should come naturally. It’s to do with the person’s willingness and ability to make themselves vulnerable, to take responsibility for their own feelings and to do their own personal work. Many people force it using technique. They are trying to use their intellect to unlock the Kundalini and it’s really not designed that way. It’s a phenomenon that happens naturally as one matures in their conscious intelligence. So one of the things that I realized when I started to open my base chakras, my Kundalini, in the beginning it was very sexual. I had a lot of sexual energy and it was overwhelming because I did not understand that it was just pure energy. Now I see that. It is a very powerful energy. This energy when it unlocks at the base chakra is like a fountain of light that goes up through the centre of the body, up through the spine and it starts to balance out the hormonal system of the body through our glands. It starts to regulate and balance out our chemical body. As it works up. It starts to open the centers on the way. At some point we open up our power centre, at some point it opens up our heart centre, we learn how to love. Then our throat so we learn how to communicate, knowing that what we say is connected to the universe through the fountain, the base. It goes up into our forehead and at the top to our crown chakra and so it opens us. It’s a whole other way of seeing reality than through the intellect, it’s a phenomenon that takes place in one’s body when one has prepared themselves. Would you say that the Kundalini is the ‘pure health’ in the body? It is. Of course diet is very important, lifestyle and exercise to keep the body healthy when we go through this process. The Kundalini takes the body and the molecular structure through a very deep purification. It goes back through and cleans out all that trauma or tension or fear that we grew up through, that we inherited from our families, our cultures, our countries, our politicians, our grandparents, and our great-grandparents. What gets passed down through the collective unconscious, as Jung would say. The family structures that we absorb in the womb from our parents, if it’s not worked through in the parents the baby absorbs that energy and plays it out in their life in some way. We all carry the history of the world inside of us. Hopefully we want to carry the positive history energetically but many of us absorbed the negative history, and we spend life suffering, wondering what’s going on? When most of it is not even ours. It’s what we absorbed and inherited from our ancestors, our parents, our family, the world around us and the country we live in. So the fountain when it goes off has a way of purifying the cellular history, the molecular history, and energetically we get to burn through the density that these old memories create. They create a feeling of heaviness and as we go through purification, clearing our seeing, our perception, we become much more intuitive as we rise above the grid of world mind and move into higher consciousness. But it doesn’t start with the intellect it starts with the foundation, the base. It’s a very delicate awakening. It is easy to make mistakes but we learn not to judge ourselves and not to judge each other, as we explore and allow ourselves to live from a greater intelligence rather than just from our belief systems. We have so much to unravel that we have absorbed, and it is different for each of us. Would you say the energy is the same for all of us? Yes. It’s almost like every soul comes from a really high place in the universe. It’s a place of love and sweetness and innocence. We are born into countries and family structures that have histories of war and famine and suffering, disease, illness trauma and fighting. Histories of mistrust and of hurting each other. So the soul takes on these behavior patterns. They are passed on for thousands of years. Every soul takes on a piece of the old world of the planet with the desire of eventually getting back to the intelligence of the universe. Letting go of what it took on so the universe can clean it up. Not only from that soul but also from the history of the family and from world mind. This is what we are really designed to do as human beings. The problem is that we forget. There are not enough of us teaching children that this is why we are here. Ultimately we are heading in that direction. If we did that in our countries and cultures we’d clean up this mess very quickly, in a few generations, rather than keep on perpetuating more violence and disease and suffering for generation after generation unconsciously. So there’s a few of us now who are awake enough that can work as a team to raise the vibration. To work together to recognize what our souls took on, what my soul took on, what we took on as a group. We hold it in the light and let the intelligence of the universe transmute it from the inside out and bring in love behind it because love is really God’s pure feeling, The intelligence of the universe is pure feeling, ultimately taking us back towards love, through matter. So your purpose and my purpose is to empty our mind enough to recognize that there is an intelligence greater than ours. It’s not religious; it’s available to everybody on this planet. The nature of it is love, so to feel love is to recognize the intelligence’s feeling that is innate to each person. Eventually the intelligence inside of us literally takes us over and brings us into a very high sweet loving reality. As more of us participate in this journey then we begin to move beyond violence and separation, all of those belief systems of ‘your bad, I’m good’ or ´my religion is better then your religion, that create separation. It’s not the truth in the bigger picture because the intelligence itself, that’s behind the evolutionary process, which we call God, never judges it’s own creation. When we are separate from that intelligence that’s when we end up judging ourselves, and each other and we create great pain for ourselves and suffering. When the intelligence, the fountain takes off and it takes the body through purification and eventually takes over, you begin to see the world through eyes of love and sweetness. It’s hard to judge your self and others because you begin to see them for who they really are. You see that they are just wearing cloaks, and they think that’s who they are. Most of us are wearing cloaks that cloak our nature with belief systems and conditioning, mindsets and rules that have nothing to do with who we are. Then we start to see miracle after miracle take place in our lives.